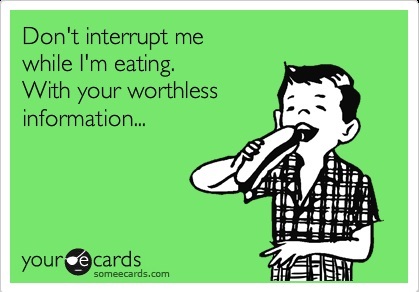 I am usually not an ill-mannered person but I don't know what gets to me whenever somebody interrupts me while eating. This usually happens on busy days at work. Of course, I look forward to taking my hour long break. What irks me is when someone just keeps on telling me what to do while eating or when someone just keeps on talking to me. I am generally a nice person. I just can't be nice when I'm hungry and somebody is hindering me from savoring my meal. Hello, trying to eat here?! I have tried not to be snappy. I know I shouldn't be. Good thing that I can still control myself somehow. Sorry for being irate but my break is my break and don't I deserve at least one full hour of it? Of course, there are cases when such a thing can't happen but that I totally understand. What I don't understand is when people deliberately try to sabotage what time I have left for myself. Wouldn't you be pissed if this happened to you as well?